OPEN DOORS IMPROV CAMP IS BACK! What is Open Doors Improv Camp? Shut the Front Door is excited to present Open Doors Improv Camp (ODIC): Where comedy meets camp for a one-of-a-kind adventure! This camp focuses on teamwork, confidence, and community. Whether you're new to improv or a seasoned performer, there is something for you at ODIC. The benefits of improv include enhanced communication skills, stronger leadership, better relationships, agile thinking, and a boost in creativity (to name a few.) This weekend is full of customized workshops, improv jam sessions, campfires, and more! Open Doors takes improv into the wilderness for a comedic camping experience. Register today. This is the kinda stuff that fuels your FOMO. And more... SO MUCH MORE. Based on feedback from last year, we learned that some of you would like to wake up to the fun rather than wake up to travel. This year, we're offering the option for accommodations for Friday evening so that you're well rested for the weekend ahead! **Please note there will be no formal programming or meals provided on Friday, but you're welcome to join us for a campfire! You will have access to the camp after 7PM on Friday, June 14th. We have pumped up the offering for camp this year and have added a 3rd workshop, a special guest instructor and more improv time together. We have a team of volunteers working hard to create an unforgettable experience where comedy meets camp! We love improv and want to be able to share it with everyone, and we also understand that this cost could be a barrier. In efforts to "open the door" (and because our community is full of generous, improv-loving hearts), we have been gifted a few Camp Scholarships to cover 50% of the cost for 5 eligible campers. We have also introduced a Community Camper Fund where those with more can donate a little- to help decrease the cost and increase the fun- for those of us that could use a little help from our friends. Every application will be read by Brandon Rudd, Executive Director of Shut the Front Door and will be awarded on a first come, first serve basis. Once the 5 scholarships are granted, they are no longer available. Looking for more information? Want to secure your spot? Below is a list of some of the things you can expect at Open Doors. + Why is Shut the Front Door Improv doing a camp? Over the past five years, we've built an improv community that we’re proud to call home. Whether you’re an improviser, a fan, or a supporter, your support has helped us flourish. That’s why we’re excited to offer this unique experience to everyone. + What’s the focus of Open Doors Improv Camp? Bringing awesome people together to learn, practice, and perform improv in the woods with a focus on teamwork, confidence, and community. Here you will make new connections and have the opportunity to express yourself through improv. Whether you’re new to improv or you’re a seasoned performer, there is something for you at Open Doors Improv Camp. Looking to improve your communication skills, become a stronger worker, or build better relationships? Want to learn new life skills and perform with Shut the Front Door in a unique environment? 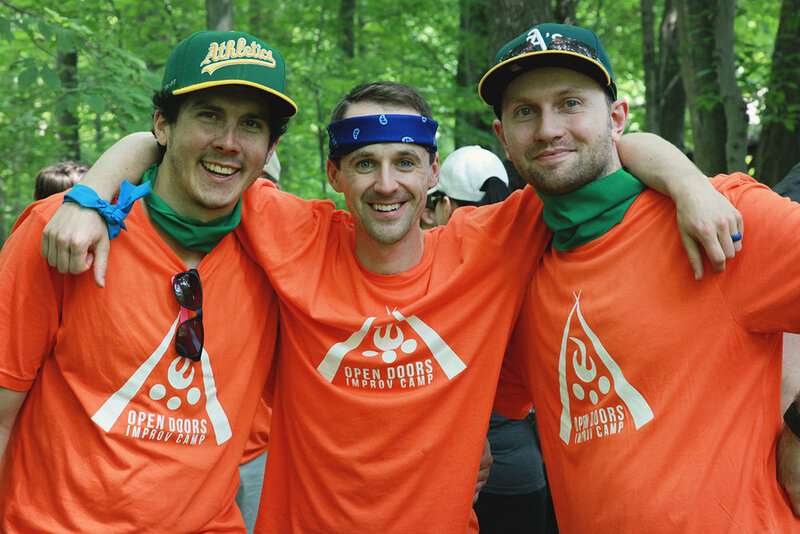 Open Doors takes improv into the wilderness, combining comedy and camping for a one-of-a-kind adventure. + Who’s going to be there? Open Doors Improv Camp is for adults who love improv, and love to have fun with other adults who love improv. We think one of the beautiful things about improv camp is that really different people can build a supportive and fun-loving community very quickly. Open Doors Improv Camp is for people over the age of 19. Groups of friends, couples, and singletons are all welcome - the counsellors will make sure you’re meeting new people regardless of who you arrive with. We encourage anyone between the ages of 19 and 99 to sign up! + When is this shindig? Open Doors Improv Camp takes place the weekend of June 15th-16th. Book off these dates now and do something just for you! Stevenson Children’s Camp is located at 5081 Gore Road, just east of London in Dorchester, Ontario. Enjoy 125 acres of improv camp fun! Visit www.stevensoncamp.ca today and find out more about the amazing location! Drive your car or carpool with friends! The camp address is 5081 Gore Rd in Dorchester. There will be designated parking available. + What will I eat? All of your meals are included! Think of your favourite camp food, but upgraded for your adult palate. We have ensured that our menu is healthy and delicious. There will also be nutritious snacks available throughout the day. Regular and vegetarian options will be available. Please indicate any dietry needs on your registration form once you recieve the welcome package. + Where will I sleep? You will be given the choice of male, female, or coed bunks when you register. You will have the opportunity to request a specific bunkmate. Both campers must request each other to guarantee that they are placed in the same cabin. Do you have a health concern regarding being on the top bunk? Please indicate to let us know. Campers are responsible for bringing bedding for single bed bunks. A sleeping bag and a pillow work best. + Is there indoor plumbing? Absolutley! There are flushable toilets in a real washroom setting, and they are fully equipped with sinks AND soap! Washrooms are conveniently located near cabins and in the rec hall. Showers are also available. + What improv workshops will be available? Workshops will include options for beginner, intermediate, and advanced imporvisers. More information regarding workshops will be available soon! + How much does camp cost? + Why the price increase? You may have noticed the increase in price since last year... We have pumped up the offering for camp this year and have added a 3rd workshop, a special guest instructor and more improv time together. We have a team of volunteers working hard to create an unforgettable experience where comedy meets camp! + Are there payment plans or scholarships available? Payment plans are available upon request. Please email opendoorscamp@shutthefrontdoor.ca for more information. + Do I need to sign a wavier? Yes - you will sign a wavier when you arrive at camp. You may view it in advance here! You must also agree to and sign the terms and conditions. You may view them in advance here! We have a jam-packed day planned on Saturday, June 15th, but BYOB will be in effect in the evening. We ask that campers wait until 7:00pm to consume alcohol. In efforts to remain friends with the environment, please bring a reusable cup. There may be a prize for best beverage container! + I only want to hang out with people I already know and get hammered. I don’t like improv nor meeting cool new people. I’m allergic to fun and laughter gives me a rash. Is Open Doors right for me? It may not be your thing, but tell others who love and are interested in improv! + Can I bring my kids? My pets? Can I bring my kid’s pets? We love kids, pets, and your kid’s pets, and there are many great family camps where they are welcome. 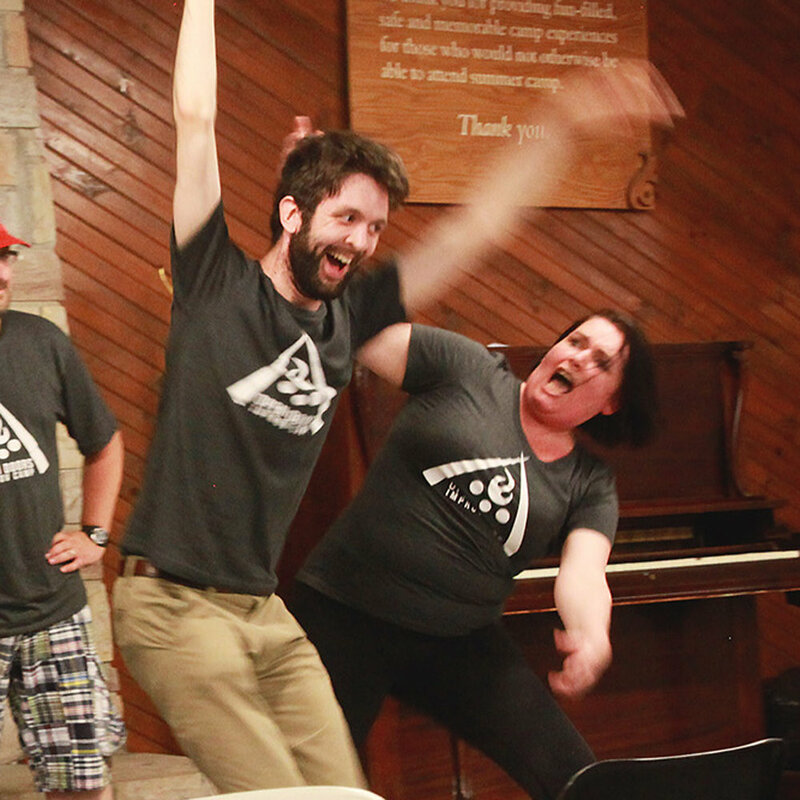 Open Doors is a unique opportunity to attend an adults-only improv camp. Enjoy a night away, unwind, and meet new people. + Can I arrive late? Sorry, we aren’t able to accept late arrivals. Registration is from 8:00am – 8:45am on Saturday. We understand that emergencies happen, and we’ll deal with those as they arise. You’ll have a phone number to call in case that happens. + Can I leave and come back? Due to safety reasons, we are not permitted to allow in/out privileges after you arrive. If you’d like to leave, we are not able to admit you back to camp afterward. We’ll send you a detailed packing list with your welcome package. A sleeping bag or sheets and a blanket are required. Your head and neck might thank you for bringing a pillow. + Can I bring my phone and other gadgets? Of course, but we do encourage a digital-free weekend. We welcome you to take pictures. We will also be taking professional photos at camp and posting them in our private Facebook group that you may download and share. There isn’t, unless some raccoons have gone in on a data plan with a hotspot. But you don’t need it at camp. You can be free!